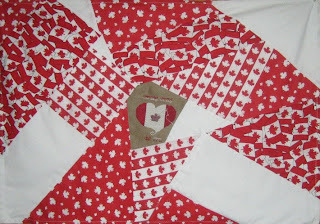 I recently was given was Canadian themed fabrics and had this crazy idea to use a cute little panel that was designed by Frishawn... my BFF. Here is what I came up with. I sewed it up this afternoon. I used bigger pieces of fabric then I usually use for crazy quilting but think it turned out well.